Dr. Kevin Frazier’s destiny was set in stone by the time he was born – or so his family thought. Which actually suited Frazier just fine. With his sunny optimism, he has a huge capacity to bloom where he’s planted, and he was certainly proud of his family’s legacy. But as he made his way through high school, he couldn’t help being drawn to his brother-in-law’s profession: dentistry. By the time he began his junior year at the University of Florida, he was hitting his stride. “That’s when I became an avid student,” he says. Frazier double-majored in zoology and anthropology, got involved in research, and graduated with high honors. He then spent a year working in a dental laboratory in Ft. Myers, Fla., to raise money for dental school and increase his proficiency in dental skills. By the time he returned to his alma mater for his dental degree, he knew he was on the right path. He even squeezed family life into his schedule, marrying a University of Florida nursing student. “I knew I married well when my wife allowed me to go on my first dental mission trip to Haiti during our first wedding anniversary,” he says. 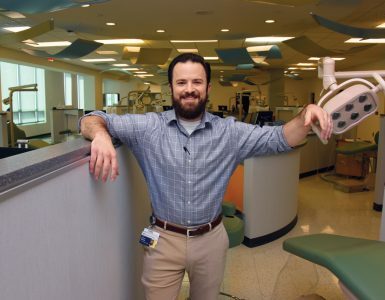 After earning his dental degree and completing a general practice residency, Frazier worked in private practice in Gainesville, Fla., while serving on the University of Florida College of Dentistry faculty part time. He soon joined the faculty full time, acknowledging a somewhat disorienting adjustment period. He had such natural rapport and affinity with the students that the UF dental school soon asked him to chair the Student Affairs Committee, a challenge he took on with gusto. It was in 1995 that he looked a bit farther north to advance his career. He laughs that his hyper-anxiety about the visit stood in stark contrast to the relaxed vibe of those who interviewed him. “Everybody was so easy-going and friendly,” he says. He also leveraged his proximity to a liberal arts university (Augusta State University, now the Summerville Campus of GRU) and earned a specialist degree in education. “Our tuition reimbursement program made it very affordable, and the College of Education faculty challenged and inspired me,” he says. To satisfy the coursework requirement to create a campus improvement project from scratch, Frazier in 2008 launched a student service and leadership honor fraternity for GRU: Alpha Upsilon Phi. “I noticed that most of our good student leaders come from the middle of the class,” he says. “They’re well-rounded, academically competent, extremely ethical, and compassionate enough to want to make things better for others. I wanted to create an organization that recognized them and cultivated. A few months after the project was graded, he’d turned AUPhi into a reality, achieving the daunting task of toppling the de facto silos that often limited interaction between students in different colleges. The fraternity’s inaugural initiation ceremony in May 2008 was the first event to take place in the newly remodeled Auditoria Center. 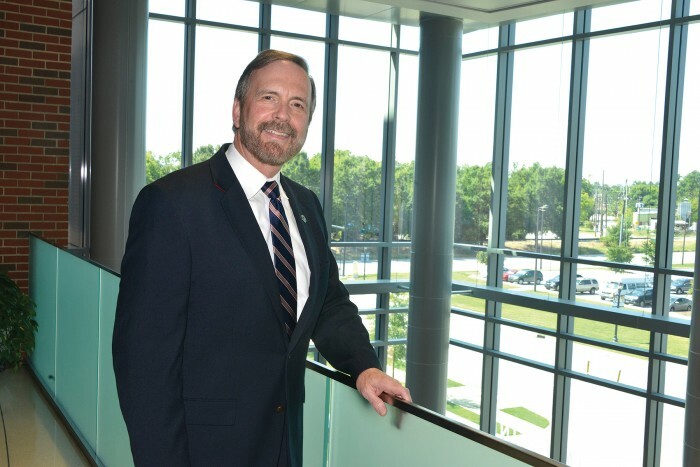 Frazier was offered the job of Vice President for Student Services and Development campuswide, while still retaining his College of Dental Medicine faculty duties half time. He eagerly accepted, quickly amassing achievements in student development including expanding AUPhi, starting a chapter of the academic honor society Phi Kappa Phi, initiating an interprofessional student leadership class, enhancing the capacity of student health services, and raising the profile of registered student organizations, including the Student Government Association. 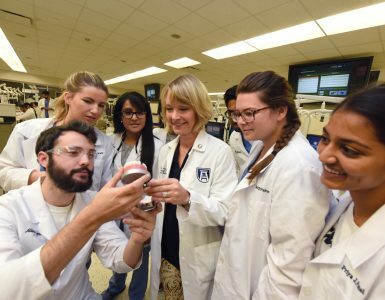 So when College of Dental Medicine Dean Carol A. Lefebvre recently invited him to come back to the dental college full time – this time as Vice Dean – he jumped at the chance. 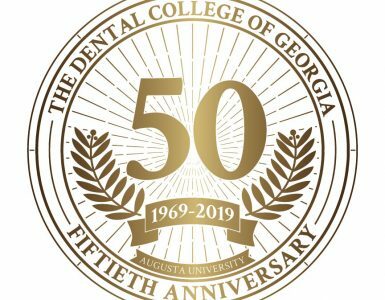 “Lots of exciting initiatives are underway that can greatly benefit the College of Dental Medicine,” he says, citing examples including a BS-to-DMD degree program, opportunities for health sciences students to pursue an MBA in GRU’s Hull College of Business, and a newly reorganized GRU Faculty Development Office to foster interprofessional opportunities for personal growth and career advancement. As much as Frazier enjoys his job, his chief source of pride is his family. Wife Mimi is Director of Nursing for an ambulatory surgery center. Daughter Kaitlyn is a medical student at Emory University, and her younger sister, Jaclyn, is a senior studying communications and business administration at GRU. The girls are as well-rounded as their dad; Kaitlyn, a newlywed, was Ms. Georgia Tech and an honors graduate in biomedical engineering. Jaclyn is a gifted artist who recently accompanied her dad on a mission trip to Romania. The Augusta area, Frazier says, was a great place for his children to grow up and launch their dreams.